This might sound silly, but one of the key features of a roof is that it is, of course, always out in the open. That means it’s vulnerable to all sorts of different things, but most specifically, oxygen in the air, and water from rain and dew. And these two substances are the breeding ground ingredients for a pest nastier than rodents: moss. For a host of reasons, the fungus is a roof’s worst enemy. First off, aesthetically speaking, it’s not the most appealing thing to look at. But even beyond impressions, it’s terrible for your roof, as its growth creates cracks in the tiles themselves. It also leads to their discoloring—which, as a homeowner, is the last thing you want—and eats away at the hard work you’ve put into your woof. All that tiling and a simple moss messes it up. As we say at Custom Coatings, no way! As volatile as moss can be, it’s even easier to have it removed. One of the most reliable services we offer is power-washing: an eco-friendly and effective measure that will help remove that moss today. Basically, what we do is use a cutting-edge technique to wash the roof and remove any algae or moss build-up, ensuring that these funguses are gone for good. Once that’s done, your roof will be ready for its greatest feat: cool roof coating. 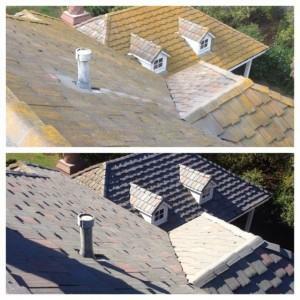 This, of course, is what we’re known for: applying a sealant and coating that will ensure the future of your roof for years to come. This is an essential for all roof owners: not only will it add resiliency against the forces of nature, but it’ll also guarantee a moss-free home. Not to mention the other benefits: saving money on power costs, stabilizing the temperatures within your home, and using the roof to your advantage, not your disadvantage. With these measures in place, your roof will be as healthy as ever, which is good for your wallet, too. And it’s not too bad against that moss either. For more information or to schedule your moss removal, contact us today!